The NFU has recently published their findings about UK supermarkets’ commitment to stock British produce and the results my surprise you. All of the major supermarkets have been quick to jump on the buy British bandwagon and promote their credentials as supporting homegrown but do the facts live up to the hype? In some cases it would appear not. 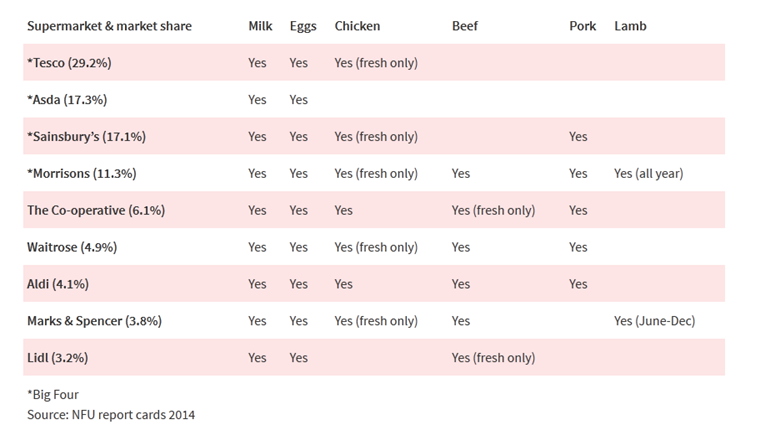 The chart below shows, at a glance, those supermarkets that have a commitment to stock 100% British across 6 main categories. Morrisons lead the table stocking 100% British across each of the 6 sectors. This somewhat reflects the results of our own poll, which also gives much credit to Waitrose’s effort to support British produce (link here). Make of these results what you will, but a recent YouGov survey showed that 79% of British people think British supermarkets should sell more food produced on British farms. So, unfortunately it seems that our two largest supermarkets, Tesco & Asda, seem to the failing to listen to what their customers want. M&S only have a yes against five of the six, is the table or the text wrong? If the table is correct then M&S is on a par with Co-Op, Waitrose and Aldi. Morrisons should be commended for their efforts. You are indeed correct. The table is right! This is why I shop at Morrisons. Let us hope that the current problems at Morrison’s doesn’t encourage them to look overseas for their products. Morrison’s have been my ideal supermarket for years, their Market Stall area is far and away superior to the competition. As a family we shop at Morrison’s when we can, which is difficult when my wife works for Tesco and has done for over 20 years…. This is why I shop at Lidl or Morrison and belong to a protest group working to prevent Asda from building another big ugy block next to our local market. I have learned not to trust “super” markets on where the produce comes from. The oranges etc. have to be imported of course, but why do they buy apples from abroad when we grow perfectly good ones here? (If not better).I buy meat from the local butcher who knows where it came from, bread from a local baker ( that doesn’t blow me up like a balloon), fruit and veg from a local supplier ( that very often still has the dew on it). Its all fresh its all British and local too. Beat that Tesco! I’m disappointed that Tesco’s, a British company, aren’t making more of an effort. Credit to Morrison’s and echo the sentiments above that they can get past their current problems. To that effect I do and have done my supermarket shopping at Morrison’s which is further away than Tesco’s to me.